I just realized that you´ve spent a great deal of time in Deep Purple by now. How would you describe these years? Don Airey: Yes, I´m amazed myself. Well, very fruitful and I couldn´t have wished for anything nicer to happen to me actually. It´s a great band, great music and it´s well run. We have a great crew. It´s not an easy gig, I have to tell you, following Jon Lord, but it´s been a great experience. You have a new album out, “Keyed up” and I have to say that the opening song, “3 in the morning” is stunning. 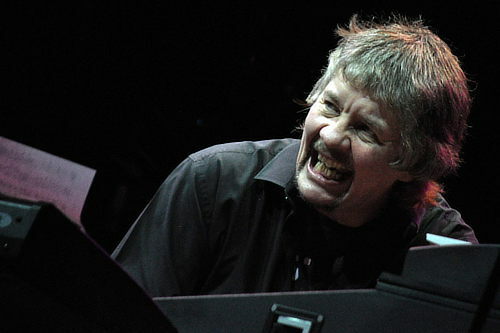 Don Airey: Great! It was one of those songs that came about pretty quickly. It got knocked into shape in a day or two and it was just a couple of takes. It´s one take with a bit of a jam at the end. It´s called a “bread and butter track” really. It´s really stock. Read what Don has to say about old friends, “organic” recording, posthumous Gary Moore’s contribution, playing for the BBC at the age of 13, who of the great guitar players (Blackmore, Schenker and Moore) is the most difficult, Bob the genius, and many more things in Metal Shrine. Posted by Nick Soveiko on Monday, February 3rd, 2014, filed under News. You can follow comment on this post through the RSS 2.0 feed. You can leave a comment below, or trackback from your own site. Well, he stated it again regarding another Purple album. “He lives for it” and wants it. Sure hope he pushes for it. SOON!!!!! Great insight from a great musician. “the problem” is their busy touring schedule,great things happened with the world class producer last year,and I hope they will get together with Bob for one more sometimes this year or next the latest.